Has anyone tried Tap & Pay on your newly upgraded VZW Moto X? I do not see that option within Google Wallet. I will need to stop at a 7-11 and give it a try (and really embarrass myself if it doesn't work). Uninstall the play store version. Make sure you clear data and cache first. still1, ChuckG73, NealJ777 and 2 others like this. Okay. Thank you. I'll have to try when I get home. I can't download it right now. I'm wondering this as well. I saw in another thread that the reason it isn't working right now is we just need an update from the play store anyway. Debating if I just wait for that or try this. I've had no luck. Tried uninstalling, restarting and still had no luck. 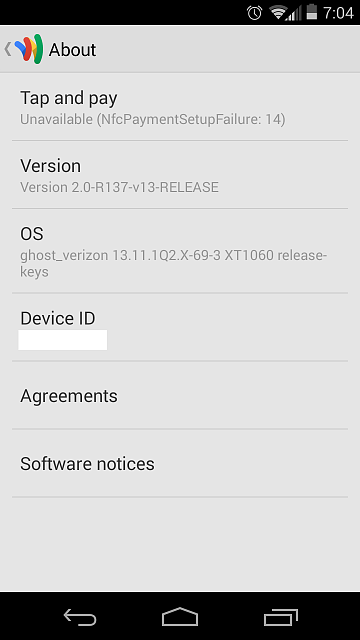 I'm on a VZW 4.4 Moto X. Any suggestions? I went to Rite Aid and got some candy. It didn't faze the cashier at all. She acted like people pay with their phone every day. Before you uninstall, make sure you delete the data. You need to go to Settings / Apps and uninstall from there. Or people can deactivate Google Wallet on the Google Wallet website if they forget to delete the data before uninstalling. I didn't delete the data or anything that drastic. I just downloaded the Nexus 5 apk and it installed right over the previous Google Wallet app I had on my phone. I went through the quick 2 screens on the Google Wallet app to enable tap and pay and it worked. Went to tap and pay in the settings and Google Wallet is now showing. I'm good to go! Thanks Motorola. I'm really glad I took advantage of the upgrade glitch to keep my unlimited data on Verizon. Best move I've made. Great news! Go forth and tap and pay! We need as many people using Google Wallet as possible to bring this into the mainstream! I am so glad you all are sticking GW up verizons ...rear. Can't wait to do the same with my ATT moto x! Tried it. For some reason this phone won't show up in the Google Wallet website. I removed all other phones on the site. Then I cleared data, uninstalled, and reinstalled. I even tried putting $20 onto wallet. You did use the copy of Wallet mentioned in post #2, correct? Tried this method after seeing it at Droid Life earlier. Successfully purchased a bottle of water from a Paypass-enabled vending machine at work. Yes. I've tried the apk from a few different sites. All the same 4.4 apks from the Nexus 5. So where are you on this - APK loads, it runs, but no device on Wallet website? I just loaded, but forgot to clear data, and the Nexus APK reset the data for me. Came right up. This was after realizing I needed to turn NFC on to enable Tap & Pay. This is a shot in the dark, but do you have NFC turned on? Yes. I've toggled on/off. Wallet won't show in the tap n pay section at all. It took some work and an update to Wallet, but think I finally got Wallet ready for Tap and Pay on my soaked VZW Moto X w/ 4.4...if'n I can ever find a pay point terminal here in Podunk, VA. I even got a $0.53 deposit to my checking account from Google as part of the confirmation process!